It’s easy to post social media messages and images nobody will care about. We do it every day. Look at what my son did! We just ate at this amazing restaurant. I bought a Grande latte, but they only filled it to tall. We are excited to release this new product. Now, I am certain your family and friends love these posts. They care about what you do, where you go, and who you meet. But that’s because they care about you. They have to. They should. They’re your friends! Your family!! But that random person scrolling through their news feed who you’d love to be your customer? They don’t give a $#!&. Your social media posts are falling on deaf ears today because there are millions of posts just like yours populating the interwebs every damn second. Everyone (and I literally do mean everyone) is trying to sell something. It might be a product, or it might be a laugh. Whatever it is, it's competing for your customers' attention…and you will lose. I’ve written about business purpose before, and that’s because it should inform everything you do. 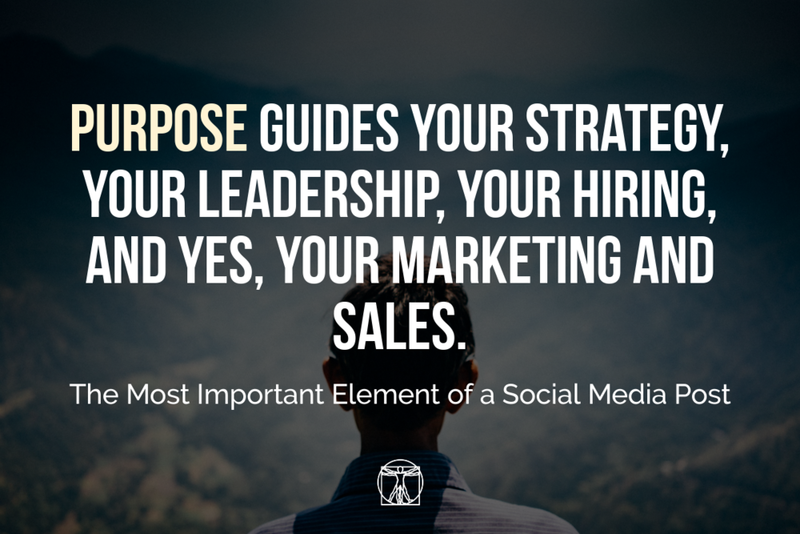 Purpose guides your strategy, your leadership, your hiring, and yes, your marketing and sales. And when it comes to social media marketing, unless you are in the business of showing off how cool your company looks, or what your product does, your social media posts MUST have a purpose as well. Here’s a helpful exercise for you to do right now. It will take less than 60 seconds. Go to your favorite social media platform and pluck out a post you hoped would do well but didn’t. Remind yourself of what the post was about and what you expected out of it. Now, ask yourself, what was this posts purpose? Was it to generate sales? Was it to get shared on other people’s timelines? Was it to drive website traffic? What was it? Now, with that purpose in mind, ask yourself why anyone would take the action you wanted them to take given what you posted? It might be shocking to realize, but many posts you create have big hopes and dreams but will never realize them because they don’t align with their original purpose. That’s it. That’s what I posted. Nothing happened at all. Not a single like, share. Not even a single click. Why? It’s easy to see when going through the exercise above. Here’s a post whose purpose is to generate web traffic with no picture, no meaningful text, and a strange web link that looks like it might lead to a scam on the dark web. I mean, really. “Deliver on your promises… Turn ideas into reality?” What the hell does this even mean? Of everyone on Twitter scrolling by—516 people to be exact—not a single person clicked, liked, shared, or did anything with that post. It has a purpose… to get web traffic. It recruits an interested party (@ghergich) to help share or like it. It has an interesting image that causes you to pause and read. When you read it, you either identify with it or you don’t. And if you identify with it, you are more likely to read the text itself, like, or share. Its text says what the post is about; an infographic on social media marketing practices. Its text uses some basic copywriting techniques to generate interest. “In case you missed it,” and “you need to know” are two phrases that arouse the fear-of-missing-out-syndrome. I hash tagged the hell out of it. Anyone interested in social media marketing, startups, small business, or content marketing will have a chance at seeing this scroll through their Twitter feed. Over 1,500 impressions… 3x more than the first tweet. Most of that coming from the 6 shares and 4 likes. Not a blockbuster post by any means, but it goes to show how spending a little time aligning your purpose with your message can take you from zero to something. This is a post I could re-run. This is a post I could promote and expect to get a great ROI. Have a clear purpose in mind when creating your next social media message. Write it down if you have to. Grab your customers attention with a profound statement, enticing picture, shocking statistic, or intriguing question. Write a short, to the point message that aligns with your purpose. Remember, nobody cares about you, your new product, etc. They care about themselves. So make your post about them! Ask how you are helping them, making their lives easier, adding joy to their day, or otherwise getting them closer to their hopes and dreams. Add a few relevant hashtags. Is there anyone you can mention? If so, do it. They just might help by sharing. Edit, edit, and edit again. Remove unnecessary words, get to the point, and make sure every last letter aligns with your purpose. Do these things, and you could see a 3x increase in your social media engagement, just like I did. They key is to try these ideas out now. Don't wait. While it's fresh in your mind, share your next greatest post on your favorite social media platform and let me know how it goes in the comments below! Mike Mehlberg helps entrepreneurs and business owners develop a clear and focused strategy to stand out in their market, outsmart their competition, and achieve maximum sales impact. Grab his free 3-Step Strategic Planning Worksheet to grow your business with purpose and speed.